You’ve started a promising business and you’re ready to make those great ideas happen. As any successful entrepreneur will tell you, it’s not enough to have a great plan, it’s all about how you execute. Time to get organized! In today’s distributed workforce, collaborating face to face isn’t always an option. And while Phone.com powers business communications, providing affordable phone service wherever you do business, a good phone call is only part of the solution. Here’s the list of tools we find essential to collaborating at Phone.com, particularly since our own team is distributed across the United States! These simple and free online tools will keep employees in the loop and help your business stay organized. I haven’t used a desktop word processor in years. Why? Because at some point, any word I write, presentation I create or spreadsheet I compile, will need to be shared with someone. And when it comes to collaboration, I know my colleagues will always have something they want to contribute. Cue Google Apps—the best way to create, share, comment and collaborate on documents, spreadsheets, presentations and more. Sharing a document, presentation or spreadsheet with others who can edit and comment in real time. With versioning, it’s easy to see how a document evolves during the collaboration process. Use Google Forms to create customer surveys with responses neatly stored in a Google Spreadsheet. Access your documents from anywhere with an Internet connection because it all lives in the cloud. While Google Apps is only free during their 30-day free trial, you can downgrade during that time to their standard plan. If you’re still saving files directly to your desktop, you might want to reconsider. Ever worked on a document that you needed to reference in a meeting but forgot to save it on a thumb drive? Or found yourself on an email thread with ten versions of the same document and unorganized feedback that’s hard to filter? These are all good reasons why to start using a cloud-based storage service. 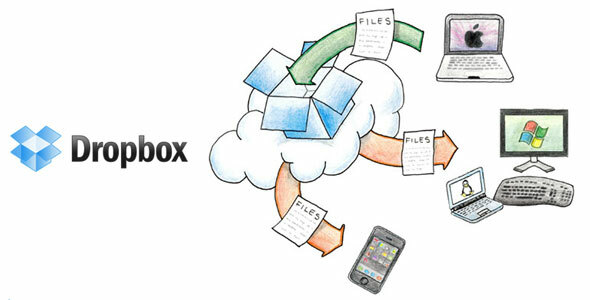 Keeping files in one place, which can be shared with anyone and accessed from any device. Sharing files too large to send as email attachments. Dropbox lets you share a link so that only one version of a file exists and anyone with permission can download it. Never having to say, “Do you have the most recent version of that?” again. The second you update a file, the changes sync automatically to anyone who has access to it. Trello is a simple yet extremely useful project-management tool. There are lots of project-management tools out there, but Trello is our favorite because of its simplicity. Think of it as a Post-it note to-do list. Trello helps your team keep track of tasks, who’s working on what, and when they’re completed. Listing all the to-dos related to a project and providing an easy dashboard to keep track of what’s done and what’s not. Keeping track of who’s working on what. Moving feedback out of long complicated email threads and into a more actionable environment that everyone can see and collaborate around. InVision is a powerful online tool for building, sharing and presenting functional application and web prototypes. It’s also great for sharing just about anything visual because it offers powerful commenting and feedback capabilities. Building functional prototypes for web and mobile apps using wireframe illustrations. Holding live feedback sessions where users can comment, annotate and illustrate over images. Managing an entire design project from concept to completion, with versioning, comment tracking and a detailed activity feed that shows who’s doing what and when. We all spend a lot of time online and there’s a reason we do—the whole world is at our fingertips! That’s a lot of information to keep track of and this is where Evernote helps. If you’re the kind of entrepreneur who loves scouring the Internet searching for inspiration, competitor research or just about anything, Evernote is the tool to keep track of what you find most important online. Create inspirational artboards, bookmark webpages with your own comments, write lists, create to-dos, and collaborate with others. Accessing bookmarks and inspiration boards from any computer or smartphone. Keeping handwritten notes and digital details related to your projects in one place! Sharing and presenting your Evernote content with colleagues in real time. Got your own favorite collaboration tool? Share yours in the comments below.